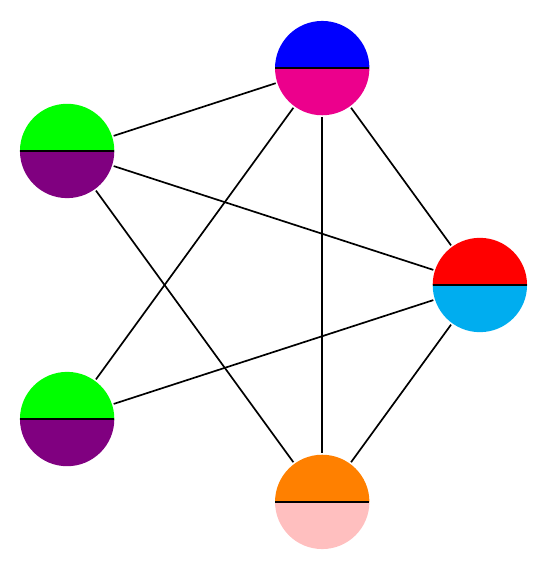 Using an idea posted here I'd like to draw a graph of vertices and edges using some split circular nodes (and colored differently). Unfortunately the edges are not ending nicely. It would also be lovely if I could set teh minimum node size to 6mm instead of my hack for each vertex. Is there anything that anybody could suggest? alias=tmp@name, % Jake's idea !! You need to add shape=circle split when creating the nodes so that the shape and its anchors are constructed correctly. Then the edges connect nicely because the appropriate anchors exist. Correct syntax for specifying the minimum size of nodes. This can be specified as an option to tikzpicture as shown, as an option for a scope or on a per node basis. How to draw points in TikZ?